The first thing you should do is right-click the image below--part of the Atlantic Yards master closing documents, first made available today--and open it up in a new window. 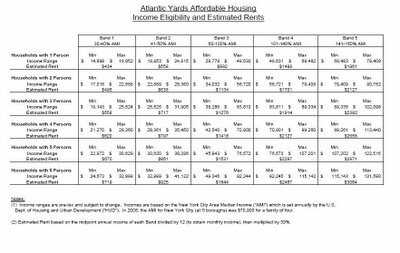 It offers several more scenarios regarding affordable housing in the Atlantic Yards project, promising affordable units with no low-income units and far less affordability to the constituents of ACORN, the advocacy organization that supplied the most foot soldiers at public hearings in favor of the project. But that "fully affordable" building might be a dodge on two levels. First, most units would be unaffordable to those who most passionately advocated for subsidized housing. Second, "affordable" units at 165% of AMI as I wrote in April and July--would easily fall into the range of current market prices. A studio apartment for someone at 160% of AMI in 2006 would cost $1861 a month. Consider that the limit has risen to 165% and AMI has risen, even as studios at new towers in Downtown Brooklyn cost well under $1861. But the sales pitch often revolves around “net effective rent,” which takes free rent into account to bring the number down further. That could mean net rent for a studio starting at $2,000 in the Hudson Yards area and about $1,400 in downtown Brooklyn. In fact, perhaps 40% of the AY affordable units could track market. That's the potential under Scenario #1 in the chart at top. 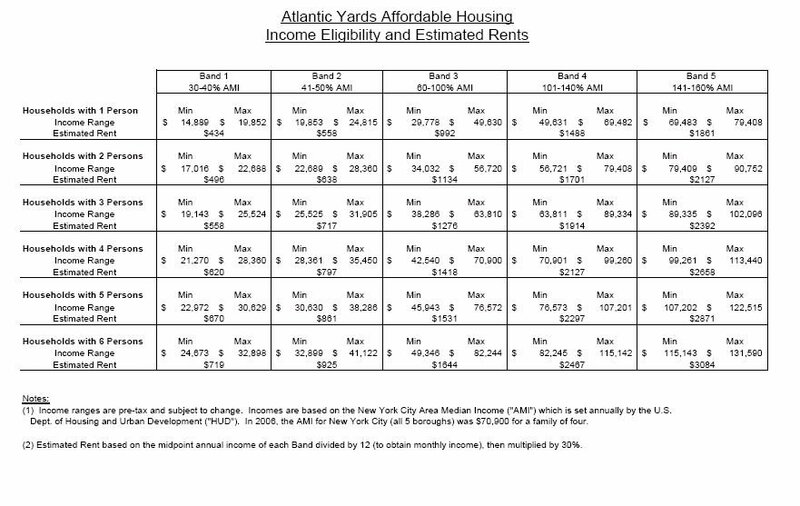 That seems a proxy for the commonly-understood (and -promoted) version of Atlantic Yards affordable housing, as described in the chart below released in July 2006 by Forest City Ratner. Already one tweak evident in Scenario 1 would help the developer's bottom line. In all three scenarios contemplated in the Housing Memorandum of Understanding Forest City Ratner signed in 2005 with ACORN, 5% of the AY rental units, and thus 10% of the affordable units, would be for households with incomes between 30-40% of AMI. That number has been reduced to 3% (and thus 6% of the affordable units) under Scenario 1. Also, as I reported in July 2006, the developer initially promised that 900 of the 2250 affordable apartments would go to moderate-income people earning 50%-100% of the AMI. Rather, only 450 units would go to moderate-income people, and 900 would be aimed to the middle-class, earning above the AMI. The scenario was, in fact, one of three anticipated in the Housing MOU, but it was not the one the developer promoted on its web site for three months. Let's look again at the chart at top. Scenarios 2 through 5 would include between 60% and 80% of units at 165% of AMI, with zero low-income units. Thus there would be all-affordable buildings with 60% of AMI as the floor. HDC agrees to provide 2nd mortgage subsidy outlined in Scenario 2 on the condition that complete application and submission is with respect to Scenarios 1, 5, or 6, and HDC provides notification that it is unable to provide new and/or recycled private activity tax exempt bonds to FCRC due to a lack of availability. In other words, HDC would contemplate Scenario 2--a building with 80% of units at 165% of AMI and 20% of AMI--as long as there are no subsidies for three other scenarios. Scenarios 1, 5 & 6 assume that HDC will provide recycled private activity tax exempt bonds. 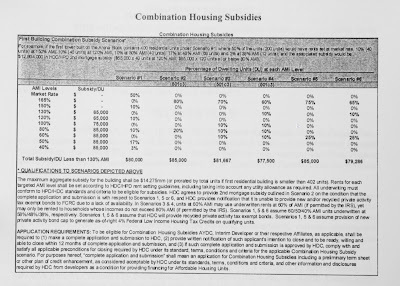 Scenarios 1, 5 & 6 assume provision of new private activity bond cap to generate as-of-right Federal Low Income Housing Tax Credits on qualifying units. In other words, everything's contingent. Both the 12/8/06 Memorandum of Mitigation Commitments and the updated 12/21/09 Amended Memorandum of Environmental Commitments produced by the Empire State Development Corporation provide lots of wiggle room. Based on currently available information, the parties anticipate that the affordable housing units will be made available to households with incomes falling within the income bands set forth in the FEIS. However, the income bands may be adjusted to accommodate the requirements of any City, State or federal housing program utilized for the construction of the affordable housing, subject to City approval.